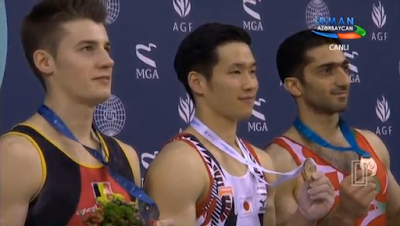 Belgian Gymnastics: World Challenge Cup Baku: Silver for Maxime Gentges! World Challenge Cup Baku: Silver for Maxime Gentges! For his first competition of the season, Maxime Gentges (Gym Club Malmédy) travelled to Azerbaijan and Baku for the World Challenge Cup. And our gymnast shone! Maxime was set to compete on three apparatuses, pommel horse, parallel bars and horizontal bar. The competition was already a hit for Maxime as he successfully qualified on all three events during the qualification sessions on Friday and Saturday! On Sunday, let's go for the finals! Maxime started on pommel horse, where he performed a beautiful and clean routine to score 14.700 for 2nd place! Japan's Tomomasa Hasegawa easily won the event with 15.400. Saeed Reza Keikha, from Iran, won the bronze medal with 14.450. Maxime qualified in 8th place on parallel bars in qualification. Today, after a small istake, he finished strong with a great double piked dismount. He got 13.800 and placed 8th. But the competition was not over yet for our gymnast as he still had one final: horizontal bar! Being the last gymnast to go on a competition is never easy but there was no problem for Maxime! With a beautiful exercise, he scored 14.100 for a 4th place finish! Maxime's results in Baku are very encouraging and set the bar for the rest of the season! In Azerbaijan, he won his very first medal in a World Cup event but I'm sure it won't be the last one!